With the Minnesota Wild about to be unceremoniously knocked out of the Stanley Cup Playoffs, there are plenty of bad feelings to go around. There’s lots of grieving yet to be done by their fans, and there’s even more post-mortem dissection on its way. Right now, the team, its media partners and plenty of fans are doing their best in damage control as they face a 3-1 deficit, and that includes making excuses for how things are going down. All of these excuses are somewhat based in reality, somewhat factual, and are being widely accepted by Wild fans as to reasons why the Wild will eventually fall to the Jets. However, all of them mask the original and most important reason the Wild will lose to the Jets: they’re not as good as the Jets. Now, lesser teams defeat better teams in the Stanley Cup playoffs all the time. It happens every year, and there are lots of reasons for why that happens. The Wild could have been one of those teams, without the aforementioned excuses, but it still would have definitely been an upset, because again, the Wild are not as good as the Jets. Let’s examine some of those excuses. When Suter’s ankle shattered like cheap glass against the boards in Dallas, the Wild’s playoff chances took a massive hit, for sure. Suter was having an incredible season, and he and Jared Spurgeon formed one of the best defensive pairs in the league. Suter’s injury didn’t guarantee the Wild’s eventual playoff departure, it more just expedited it. The Jets have rag-dolled the Wild in Winnipeg, where they’ve been a powerhouse this season, leading the NHL in wins at home. At home, NHL teams can dictate matchups, and the Jets definitely use that to their advantage with three forward lines that can play with any line on any NHL team. What the Jets have done the best job of in the first two games of the series is take advantage of the Wild’s lack of depth. While the Jets have taken advantage of Carson Soucy taking Suter’s spot and Spurgeon not being 100 percent, they’ve also decimated the Wild’s lack of depth on the forward lines. The Jets have feasted on the lower end of the Wild, and while Suter may have helped that, he couldn’t have prevented it entirely. Zach Parise’s injury may have been even more deflating than Suter’s, as the Wild looked good in Game 3, only to lose their leading scorer. What little hope Wild fans had seemed dashed, as Parise remains to be the heart and soul of the team. As previously mentioned, the Wild cannot match the Jets’ depth. Even though they racked up the goals in a lopsided Game 3, the rest of the forward roster besides Parise has been painfully absent in the other three games, with just one goal from Matt Cullen in game one. If the Wild were to stand a chance against the powerful Jets, they would’ve needed scoring from up and down their lineup, especially on the road, where the Jets could’ve focused their efforts to shut down Parise in Games 5 or 7, as they were unable to do in Games 1 and 2. The Wild’s lack of finishing ability again haunts them as it did against the Blues last season and many years before that. Also familiar to last season’s disappointment is the laundry list of players notably absent from the scoresheet. The Wild don’t have Winnipeg’s depth, this is true, but they are still generally speaking a deep hockey team and should be getting scoring from players not named Zach. Bruce Boudreau said after Game 4 that the lack of a call on Jets defenseman Josh Morrissey ‘cost us the game’, as the Wild would’ve had a 5-on-3 to attempt to score in a game where they were shut out and trailed by one only until a late empty-net goal. If the Wild were able to score the all-important tying goal, it’s a very different game, obviously. The could have gone to overtime with the Jets, and anything could have happened. A 2-2 series is very different from a 3-1 series. The key word above was ‘attempt’ to score on the ensuing 5-on-3 powerplay. While it’s obviously a great advantage, the Wild weren’t exactly lethal 5-on-3 this season. The Wild had seven 5-on-3 powerplays this season, and scored on just two of them. Only nine teams in the NHL scored fewer 5-on-3 goals than the Wild, and all but three of them had fewer opportunities. The emotion from Bruce undoubtedly played a factor in what he said, as his team had been backed into a corner, and NHL officiating gave him something to lash out on. As horrible as that hit was, and as ridiculous as the non-call was, it was more likely to have only cost the Wild two minutes of further frustration than it cost them a crucial goal. Devan Dubnyk has played extremely well in the series, but has not stolen any games so far. Meanwhile, Connor Hellebuyck just shut out the Wild in Game 4, after being named a Vezina finalist for this season. No many folks watching this series would say that goaltending is deciding the series by any stretch, but there will be critics out there pinning this on Dubnyk while lauding Hellebuyck. As I said, not many sane Wild fans will be calling out Dubnyk’s efforts in this series, unless a complete Game 5 meltdown leaves a bad taste in everyone’s mouths. But even a considerably poor showing by Dubnyk in Game 5 might not sink him to the numbers than Connor Hellebuyck has put up in this series. Granted, almost all of the damage against Hellebuyck has come in Game 3, but he hasn’t looked unbeatable, and he hasn’t really been tested outside of Game 3, either. On the Playoff Preview episode of the Giles and The Goalie podcast, we all agreed that Dubnyk had to steal this series for the Wild in order for them to have a chance. While he hasn’t done that, he’s played well enough to avoid being a scapegoat. His current .929 save percentage in the series looks similar to the .925 save percentage he put forth last season against the Blues. But when compared to Jake Allen‘s .956 save percentage last season, Hellebuyck’s .899 mark reeks of missed opportunity. The Wild were the fourth-best team in the Western Conference this season, but unfortunately, only the third-best team in their own division. When comparing the NHL’s current playoff format to the old way, the Wild went from facing No. 5 Western seed Anaheim — who has already been eliminated — while having the home-ice advantage, to facing No. 2 Western seed Winnipeg, on the road. 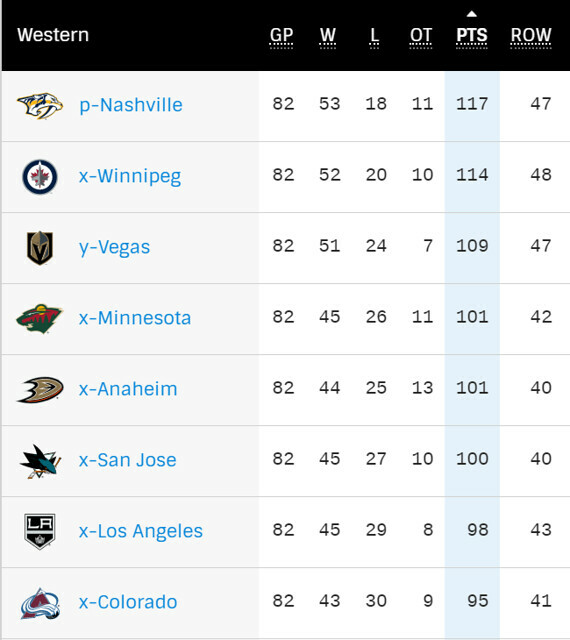 Sure, the Ducks looked horrific in their series with the Sharks, but the Wild were 1-1-1 against the Ducks this season, and I don’t really want to bring up their past struggles against the Ducks in the playoffs. The Wild’s lack of finishing may have made John Gibson look much better than San Jose’s well-known scoring punch has, and Anaheim’s infamous big and strength may have played out against the Wild much the same way the size and strength of the Jets is. While it’s an entirely valid criticism of the NHL’s current playoff structure, at the end of the day, the playoff structure hasn’t cost any particular team the Stanley Cup, from my estimation. The Wild very well may have beat the Ducks in round one of the playoffs, but it likely would have meant them facing either the Predators or (gasp) the Jets in round two, so eventually, they would have had to beat one of their Central Division foes. Even those looking for a matchup with Vegas have probably cooled their tone on that lately. In the end, a strong dose of reality is what the team needs, and unfortunately that reality is that the Jets are the better team. The Wild may have had their window to upset the Jets, and quite possibly started a great playoff run, but they haven’t done anything well enough to do either at this point. While the excuses will make some folks stomach the loss better, and quite possibly save Chuck Fletcher (and Boudreau’s?!?!) job, the realities that face the Wild aren’t nearly as rosy as several of the ‘What if’ scenarios they paint. Looking at this series from outside of the Twin Cities, and the pundits and experts that know the game, and no one was picking the Wild before it began. That’s how the Wild’s playoff success should be measured. Not be a series of excuses, but rather on the premise that they weren’t supposed to win this series, and did nothing to the contrary.